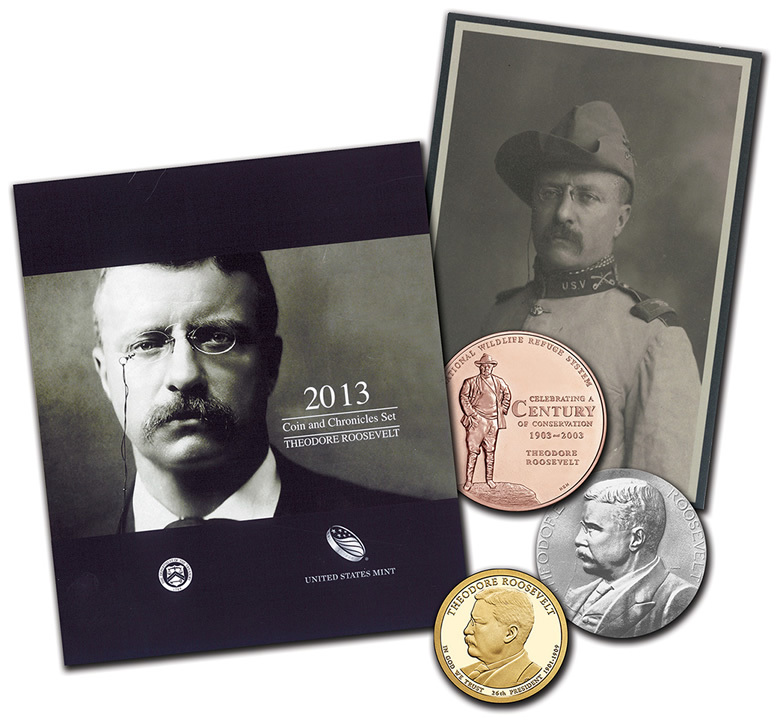 Available at noon ET today, Dec. 17, 2013, is the 2013 Theodore Roosevelt Coin and Chronicles Set, one of the year’s most unique offerings from the United States Mint. Most unique to the Coin and Chronicles Set is the Roosevelt silver medal. Never before issued in silver, it was originally offered by the U.S. Mint in bronze sizes of 3-inch and 1 5/16-inch. Struck at the Philadelphia Mint, this version has the same specifications as an American Silver Eagle except it has a smooth instead of reeded edge. Designed by Charles E. Barber, the obverse features Roosevelt’s portrait and encircling inscriptions of THEODORE ROOSEVELT. Found on the reverse is George T. Morgan’s design of Columbia with her hand resting on a column bearing a cinerary urn and devices symbolizing the authority of the United States. To the right are the inscriptions reading INAUGURATED PRESIDENT OF THE UNITED STATES SEP. 24, 1901. SECOND TERM MARCH 4, 1905. Toward the top and in the background is the U.S. Capitol. The Bald Eagle medal is also from times past, debuting in July 2003. It was the first of four designs celebrating the 100th anniversary of the National Wildlife Refuge System. 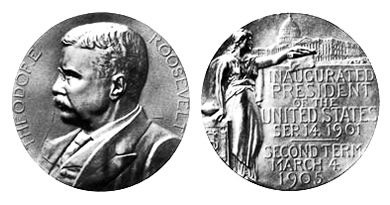 These medals shared a common obverse portrait of Roosevelt, considered the father of the National Wildlife Refuge System. Reverses depicted the bald eagle, an elk, salmon and canvasback ducks. In 2003, they were was available in .900 fine silver for $29.50 with mintages of 35,000 for the bald eagle and 25,000 each for the elk, salmon, and canvasback ducks designs. All sold out. Medals were also available in bronze for $4.50 in unlimited quantities. Within the 2013 Theodore Roosevelt Coin and Chronicles Set is the bronze version of the Bald Eagle medal. Also struck at the Philadelphia Mint, it is composed in 95% copper and 5% zinc with a diameter of 1.5 inches and a smooth edge. Obverse inscriptions found to the right of Roosevelt’s portrait read CELEBRATING A CENTURY OF CONSERVATION, 1903-2003, and THEODORE ROOSEVELT. Circling the edge of the upper rim is the inscription NATIONAL WILDLIFE REFUGE SYSTEM. This design was created by Norman E. Nemeth. 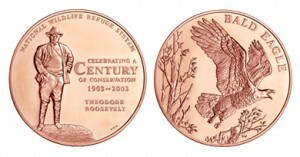 The reverse, designed by Donna Weaver, depicts a bald eagle in flight with a treetop in the background and the inscription BALD EAGLE at the top right. 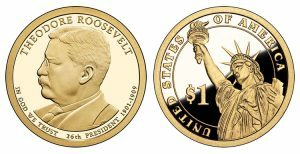 As the 26th President the United States, Theodore Roosevelt Presidential $1 Coins were the 26th issued in the Presidential $1 Coin Program. They debuted in rolls, bags and boxes on April 11, 2013. Inside the Coin and Chronicles Set is a proof $1 coin from the San Francisco Mint. Designed and sculpted by Joseph Menna, around Roosevelt’s portrait are inscriptions THEODORE ROOSEVELT, IN GOD WE TRUST, 26th PRESIDENT and 1901 – 1909. Reverses of all Presidential $1 Coins depict a rendition of the Statue of Liberty by Don Everhart. Inscriptions read UNITED STATES OF AMERICA and $1. Edges of the dollars have 2013, E PLURIBUS UNUM, and the San Francisco "S" mint mark. Orders for the 2013 Theodore Roosevelt Coin and Chronicles Set may be placed from the United States Mint using the online ordering page, located here. Orders are also accepted by telephone at 1-800-USA-MINT (872-6468). There are no household or mintage limits. This will be a popular set. Any idea if NGC or PCGS will grade the silver medal? NGC currently encapsulates the Presidential Spouse Bronze coins. Since this Medal has no monetary value I would expect it will be given a “Genuine” grading. Well, after three months, I finally received my 2 sets. They are very nice and I had to look up what the silver medallion was. I thought it was a silver plated presidential medal. I was wrong. Now, does anyone know how to get the medals out so I can examine them and straighten them? Again, a poor quality control at America’s “you can’t fire me, for a sloppy job performance”, jobs training shop. sold when their sales concluded in August 2014. A year later on ebay, a 2013 Theodore Roosevelt Coin & Chronicles Set sold Buy It Now for $219.00 + $6.00 shipping on August 24, 2015 @ 04:56 AM as Item # 191660733879 by seller abstractfashow. The original U.S. Mint issue price was $57.95. The gain calculates to be: $219 – $57.95 = $161.05, which is a very lucrative increase of 277.9%.